In our Lower Fraser Valley of British Columbia we believe that in addition to our 500 breeding pairs of bald eagles, we have over 35,000 eagles annually passing through: where do our 1000 breeders go after the young fledge and where do the other 34,000 eagles come from — and go to when they leave here? 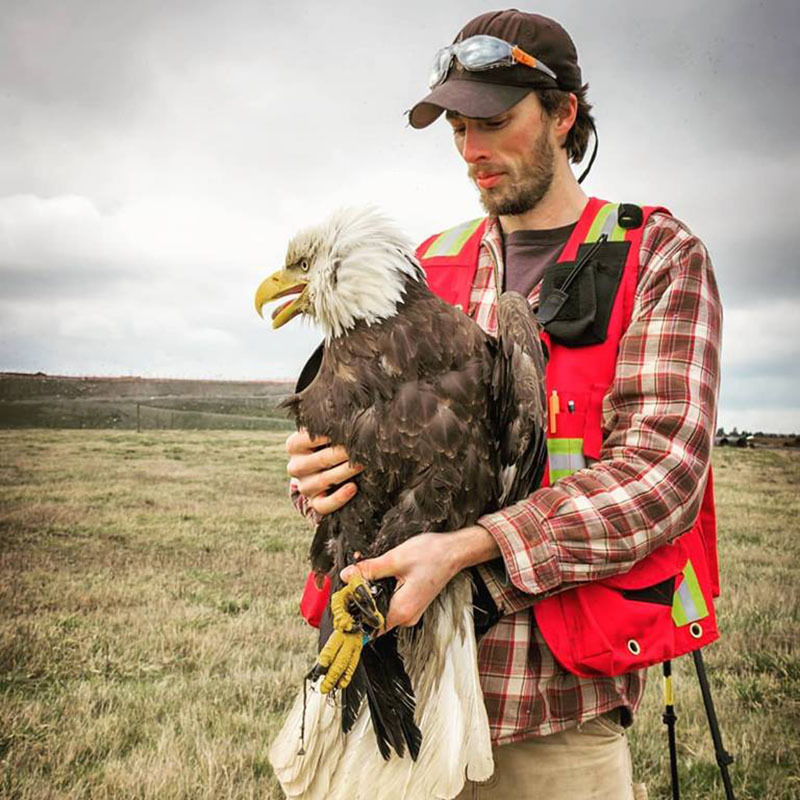 Hosting the world’s largest gathering of bald eagles, and probably having more large predators than anywhere else in the world, we are finally taking on the responsibility to find out more about them. 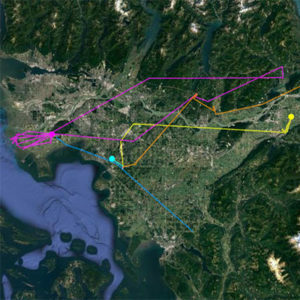 This BETA Project, in cooperation with Simon Fraser University, and in Phase 1 is a 10 year introduction to these eagle movements. 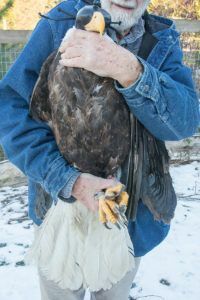 As different age classes and geographically resident eagles get tagged we hope to formulate additional questions and plan fact based managements recommendations. Is the population still expanding or now declining? Since so many eagle are dying of pesticides and heavy metals can we determine where they are picking up these contaminants? 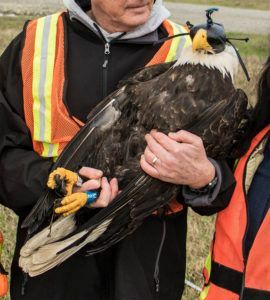 And since electrocution remains the largest local killer of our eagles can we learn something about their local movements that would assist BC Hydro in where to place perches above the killing wires? 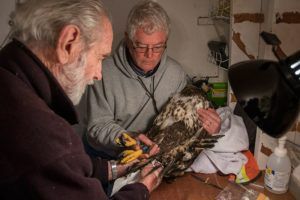 Trapping some of our local breeders and some of the thousands of migrants will be a start to our better understanding of the world’s largest gathering of bald eagles. Please support the BETA Project: follow an eagle on its annual journey. If you can contribute financially to the Project please do so. The HWF team has devoted a large portion of our consulting dollars to buying Trackers and our first grant application to Molson Breweries also resulted in a fine support grant. At about $5000.00 cost per Tracker we need your support. Please be patient while the map to the left loads, it’s plotting a lot of data as it’s up to date. This map is a dynamically generated map showing the flight paths of our currently tracked birds since the moment they first had the transmitter placed on them. As you can see, some prefer to stay local, some have ventured down to Oregon and up to Alaska so far. Bird Brain Scientists and Devoted Birders — The World’s BEST! Our Volunteers explained eagles, talked eagles and gave out brochures on HWF, the Fraser Valley Bald Eagle Festival, the wonders of the Harrison Salmon Stronghold and we also sold books to help fund the event. 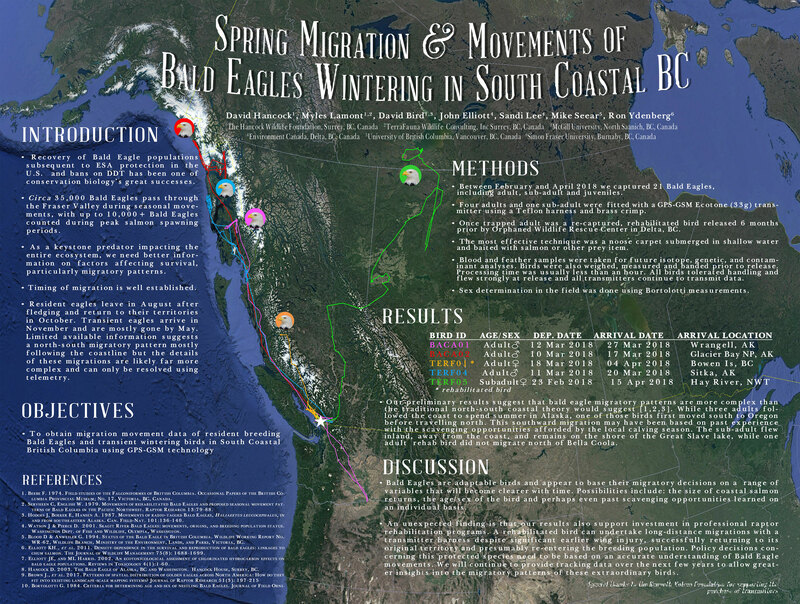 Dr. Mike Seear and Myles Lamont ‘defended’ our “Poster”, a scientific summary of our Bald Eagle Tracking Alliance Project – following the 5 tracked Bald Eagles presently Roaming Alaska and northern Canada. We supported Dr. David Bird’s daily cell phone review of the IOC events and undertaking interviews with Dr. Christian Sasse that are now archived on Christian’s Youtube channel. Finally, it was incredible to have so many old friends drop by and say, “remember when we first met”, for example, “at the Ohio Bald Eagle Conference — in 196?” and the date would trail off. I too had forgotten that first BE conference date. On and on it went – wonderful old memories ……. So now where? Locally we have several bald eagle crises – the construction of a bald eagle nest framework and two CAMS tomorrow in south Surrey. This is a very positive story of how a developer, assessing his property realized there was an active eagle nest in the middle and we have collectively resolved how his subdivision went forward but surrounds the City of Surrey’s first Bald Eagle Preserve. Quite wonderful. The Croydon Eagle Outrage: Then later in the week please stay tuned for the Croydon Eagle Outrage – yes, the eagles are outraged, the people of Surrey are outraged and I am outraged that someone cut down an active bald eagle’s nest, my nest #009, in the very heart of my City. To date some 22 citizen groups have said that this will not go un-avenged. Stay tuned as to what lower-mainland people think about this atrocity. Will the Croydon Eagle Outrage become bigger than little Surrey – Canada’s largest City? Yes, by some standards Surrey is Canada’s largest City! Again, thank you all for your good thoughts on eagles and the many hugs I got at the IOC from people both across the country who have followed our CAMS, and in several cases, initiated CAMS in their area, and from locals who I had not met before – thank you so much. P.S. At the August International Ornithological Congress in Vancouver, where we presented a poster at the conference we learned that we did not receive the signals for a slightly different reason. 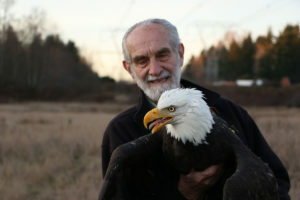 Indeed, our eagle’s transmitter was not picked up, but not because our bird was hidden in a deep Columbia River Valley. It was because the technology on our transmitter did not talk to the Telephone Company in Washington State – a slightly different frequency. That is now corrected on the additional gps tags. At 15 I learned to fly so I could be closer to eagles. Today in 2018 as I was developing the WEB Summary Report for Tracking our gps tagged & Color Banded eagles, I entered the name of the first cell tracked eagle: Hope & Expectations. Wow – it hit me! I have passed 80, so what is left: Hope and Expectations?! I was immediately reviewing my misspent youth. At age 15, as I was logging the flying time to get my pilots license, I realized that all the Canadian Gulf Islands had a pair of nesting eagles every mile to a mile and a half of shoreline – but the American San Juan Islands, sometimes a few 100 meters away, had no breeding eagles – NONE. But why? On my 16th birthday my dad gave me his car and I took the ferry to the mainland and turned south to Blaine Washington. And within minutes I knew why America had few eagles. 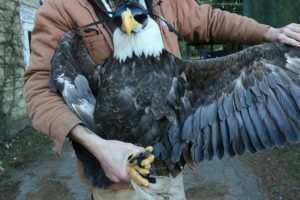 On each wintering fishing boat, waiting for its summer return to the rich Alaskan waters to fish, was a white bucket – to contain the feet and legs of bald eagles – each pair worth $2.00 in Alaska. If the bucket was filled with eagle legs the fisherman could almost earn enough “bounty money” to pay his gas north. Now I don’t just blame American fisherman for this atrocity – though only Alaska was offering the bounty. The whole world – yes, the whole world – considered all predators and scavengers as vermin – something that might compete with humans and needed to be destroyed. If you were an eagle, a hawk, a coyote, a seal or even a killer whale you were bad and needed to be destroyed. That was the message sold by every scope, ammunition and gun manufacturer – and the clothing manufacturers and other supportive industries got on the bandwagon. Thank goodness that changed through the 1960’s so today we honor the predators as key indicators of the health of our world – today those same gun orientated manufacturers promote ‘killing’ humans instead. So, as I was putting together the details and gathering in concerned associates to get our BETA Project up and running for the next year, I realized I was really driven by the same needs today as 65 years ago – to make people more aware of how we are dependent upon an ecologically sustainable world. Curbing individual greed has been our societal challenge – and remains our challenge today. Now it was even more crucial. Most of the world has lost much of the wildness, so many species have been so incredibly over harvested and had their habitat, the life-line to living, paved over or plowed under. 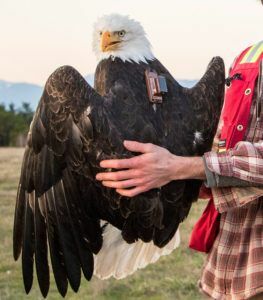 Yet today in and around Vancouver British Columbia we annually have the largest gathering of bald eagles ever known – perhaps eagle gatherings greater than 500 years ago – but more on that possible exaggeration later. Yet we still don’t understand where our estimated 35,000 eagles come from or where our locally breeding 1000 adults and their young go to after the breeding season. The BETA Project is our small attempt to bring some answers – in short to try and live up to our responsibility of knowing something more definitive about this world class wildlife spectacle. I hope that tracking these eagles will further excite those who have followed our pioneering outreach efforts of Live Streaming the nesting lives of eagles and spawning salmon, our efforts to make people more aware of our local ecological treasures through support of local organizations. For us this has been the Fraser Valley Bald Eagle Festival, the Harrison Salmon Stronghold and supporting preservation of key wildlife areas like our incredible Chehalis Flats Bald Eagle & Salmon Preserve on the Harrison River and trying to keep our Salish Sea free from spilled oil. Already we can see some of our “Tracked Eagles” are passing key ecological areas across the country – what a wonderful lesson in geography and ecology. Ok – back to the tears. Our first ‘Cell Tracked Bald Eagle’ was so symbolic to me. On most of my many annual talks I have left in a photo I took in 1964, in what is now the Great Bear Rain Forest of the central British Columbia coast. That photo shows 1 of 17 eagles I found that day – all shot at the mouth of the Bay of Plenty on Princess Royal Island, by rifle – operated by someone still not understanding the integrated ecological role of all living things. From time to time I am continuously reminded we are never far from this uncaring attitude. So, in spite of wishing everybody to get involved in naming one of our ‘traveling eagles’ I decided to usurp the first bird name – Hope & Expectations. I wrote that name down the day we released her – or him. The next day, actually two days, she lived up to wonderful expectations, sending home signals of her travels. That she/he went where I would never have anticipated is another story dealt with elsewhere. The trauma really started on the 3rd day – she did not report home. It was like a lost child – and she did not report back the next day, the next week, the next 3 and 4 weeks. Expectations were definitely diminishing. Myles and I repeatedly discussed. Did we screw up on the tagging of our first eagle? Did the equipment already fail? Had this unexpected journey south meant we had an ‘imperfect bird’ – perhaps even dying? But why no signal from the cell? Nothing was making sense. One month later she called home – wow – all was forgiven! Our techniques, the technology and terrain had all come together as they should. Indeed, keep the faith baby! For those just reading this and not understanding our cell technology all was as expected. The cell transmitters only send us a signal when the backpack signal is picked up on its daily transmission by a cell tower. No tower, no call home! Now that she did call home she sent 4 gps data points from every day for the past months travel positions. She had spent a month in deep valleys along the Columbia River in Washington and Oregon states out of cell range. Now we knew her full journey and you can too. Hope & Expectations. But today, March 24, 2018, as I was creating the Summary Table to plot all our eagle’s movements, “Hope & Expectation” was the TOTAL background world sound – the kids’ international “March For Our Lives” protests were awakening the world. It was ‘Hope & Expectation” all over again. And really for precisely the same reasons. We humans don’t just have to live more respectively with each other but live ecologically sustainably in the shared world. So here it is: the second eagle banded is being called Yolonda, after that little 9-year-old Martin Luther King grandchild who surely must have brought the world to tears. It did me. The next 17 eagles will be named after the 17 Stoneman Douglas High School students who so needlessly lost their lives – but hopefully to awaken a too complacent world. Indeed, we all pass, but it has been incredibly inspiring today, a revitalization of hope and expectations, that with a good improved path eagles and humans might continue to co-exist. The first 19 eagle names are gone. I wish – with hope and expectations – that others will come up with meaningful names to encourage our eagles on their way. We will shortly be launching an eagle naming contest.